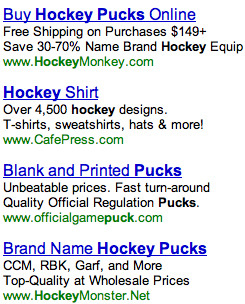 Home Ecommerce Platform 9 PPC Advertising Crimes Caught On Screen! Though these retailers will not be ticketed, fined, jailed or suspended for these offenses, the lost revenue and poor campaign performance they experience may be far more costly. 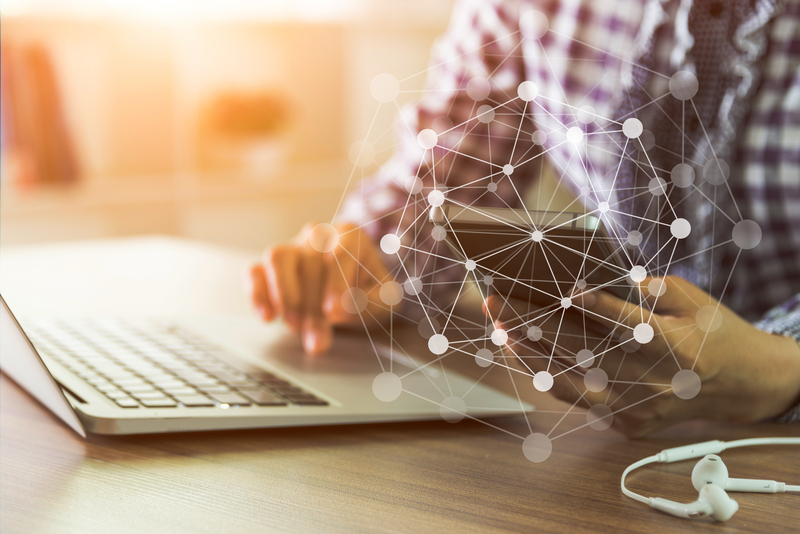 Big-budget advertisers bid on so many keywords, they often use Dynamic Keyword Insertion to show the keyword the searcher has queried in the ad text. 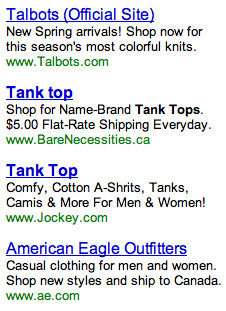 Good idea, since click through is typically higher when there’s that extra keyword relevance. Unfortunately, many lists are so big they include nonsensical keyword phrases, or keywords that don’t match the adgroup’s text, display URL or worse, the landing page. Nothing moisturizes and refreshes the skin like a coat of nail polish! 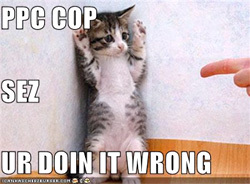 “Duhahhhh…I was just on my way hair cutting home, officer…” Sounds like Shopzilla’s had a few too many highballs. Guilty on both counts of DKI. I think Paris Hilton lets her chihuahua sleep in her Gucci bags, but most of us don’t associate authentic designer handbags with dog beds. Shopzilla does it again. Hey Billy, why be a pirate for Halloween when you can be a whoopie cushion? 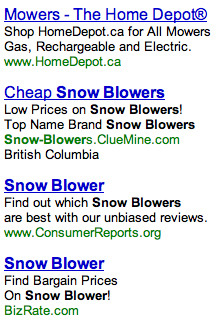 I see you’re looking for snow blowers, eh? Well, we may or may not have those…but summer’s just around the corner. May I interest you in a mower? It rhymes with blower! It’s a pooper scooper ad, but BizRate “we’s” all over itself. Where’s the affirmative action verb? Either this is an offshore PPC firm that uses the Babelfish translator, or someone’s spent too long on ICanHasCheezburger. 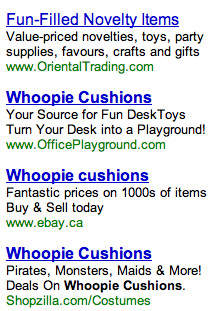 Be careful not to direct searchers to your home page when they bid on something specific. If you sell consumables, it’s crazy not to bid on brand names. 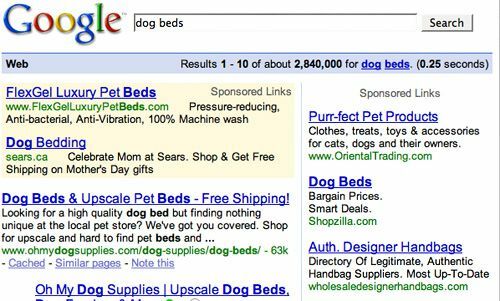 Your competitors are, and customers don’t want to waste time searching for brand and model names. 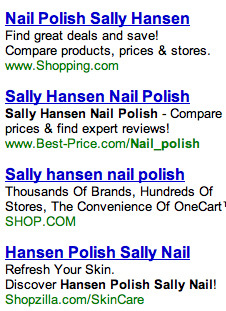 See the difference between the yellow-box (earned by high CTR%) results and the rest? What’s worse, “printer ink” is not the same as toner. Some online ink retailers don’t even carry toner. The least Printer Ink Warehouse could do is create a “toner” campaign with different ad headlines, copy and landing page. 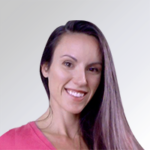 Even better, create tightly focused ad-groups around brands and models. Cookie jars! Get your cookie jars. I mean, cookie recipes. I mean, download our toolbar! I mean, er…cookies! Circuit City is way out in left field with this ad, and has no business hanging around “charm bracelets for boys.” Literally, no business. Go on, get out of here. Previous articleNegative Word Of Mouth: Crisis or Opportunity?